Lunch Time: Burger, Side & Drink for £7.95 at Handmade Burger Co Valid Monday to Friday before 5 pm! Junior Meal Deal for £5.95 at Handmade Burger Co Under 12's! Handmade Burger Co is passionate about providing fresh and high-quality food, which is why they only work with family-owned food producers and farms, keeping with the strong family values of the brand and ensuring that they get only the best ingredients for their menu. Everything in the restaurant is made to order, so it has all the best qualities of rustic homemade food - but requires you to spend no time in the kitchen. Each burger is rolled by hand each day in the restaurant, making sure that each diner gets the perfect, fresh and handmade burger on their plate. Today, a team of experts work behind the scenes to put together the perfect ingredients and buns for the burgers, with a variety of over forty different dishes to choose from. Handmade Burger Co was founded in 2006 by Chris Sergeant who remembers creating his recipes at home and asking his family and friends rounds to tell him what they thought. The first restaurant was a family affair, with everything built from scratch and a team of people who shared a passion for great food on board, many of whom are still with the company today. How do I use my Handmade Burger Co voucher? Use the Handmade Burger Co website to find your nearest restaurant. You may be able to order a delivery from your local Handmade Burger Co using delivery company Deliveroo, depending on your location. When you arrive at the restaurant for your meal, you should let your waiter know that you will be using a vouchercloud discount code when paying. This will make it easier for them to allow the discount and let you know if there are any exceptions to the offer. If you’re not in the mood for a large meal but still want to enjoy a tasty burger from Handmade Burger Co, they have smaller burgers available on the menu which are also lower in price! What are the Handmade Burger Co opening times? The opening times can often vary from restaurant to restaurant. If you want to find out the opening times for a Handmade Burger Co near you, you can use the handy restaurant finder tool on the site to find out all the information that you need to know, including the specific menus for each site. Do Handmade Burger Co cater for special dietary requirements? 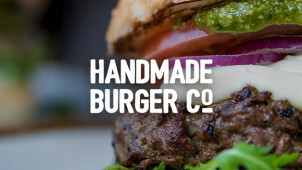 Handmade Burger Co pride themselves on customising their burgers to meet your specific needs. On their website, you can find a range of vegetarian and even vegan options on their menu, and they offer separate menus for customers who require gluten free food or those with allergies. You don’t need to book a table, but it’s the best thing to do if you’re planning to visit during a busy period so that you can guarantee your seat. Contact using their online contact form. Most restaurants are open between 12pm - 10pm. Check individual restaurant opening times here. If you’re a burger lover, then what better place to eat out than the Handmade Burger Co! Now with a Handmade Burger Co voucher to hand, you can make great savings on a wide range of succulent and tasty burgers. A restaurant chain that is passionate about bringing its customers great food using only the tastiest and freshest ingredients, you can be assured that all burgers you order are painstakingly handmade on site by the highly-trained chefs. Mouth-wateringly good! If you like to eat at Handmade Burger Co often or think that you’ll definitely be going back again and again, then make sure you’re not missing out and sign up to Herd Rewards. Every time you enjoy a tasty burger from Handmade Burger Co you will earn a stamp on your loyalty card, with one card holding ten stamps that you can then exchange for great rewards such as a free burger! If you love farmhouse style food , then don’t forget to check out the ‘Jimmy’s Farm’ range at Handmade Burger Co, an exclusive range brought by Jimmy Doherty. Choose from a variety of locally-sourced beef or pork burgers with a range of extra fillings, relishes and seasonings to suit your taste buds, before scoring a healthy saving with Handmade Burger Co offer from vouchercloud. Lookout for our popular Handmade Burger 2 for 1 code, and bring a friend for a free meal on us!